Many of you who have been in the corporate world for a little while have probably attended a course (or two, or three) on communication. We also learn that the sender chooses a channel, encodes the message, and sends it. Then, the receiver decodes it. As an example, let’s say I need to tell you about a management decision. I choose to send you an email (the channel). I type the information that’s in my head in an email (encoding), and I click on “send.” You receive the email, open it, and read (decode) it. It all sounds fine, doesn’t it? But what if you and I have a history of conflict and distrust? Will you read the message and understand it the way I intended? This is why it’s so important to connect, rather than just to communicate. When we communicate, we’re simply delivering a message. If we connect, we build relationships, form associations, and establish links. When you communicate, it’s like a television broadcast: you talk to many people and they see you and hear you, but you don’t connect to any of them. It’s purely about sharing information or knowledge. But when you connect, there’s something more personal about the interaction. It’s about recognizing another person as someone in your “tribe,” and cementing your relationship. It’s about forming a social bond rather than simply sharing information. Connecting can take effort, and you may need to make yourself more vulnerable than when you just communicate. And, it’s difficult to create a connection without being authentic. Most importantly, communicating is transactional, while connecting has the potential to be transformational. A worthwhile read on this subject would be Judith Glaser’s book, “Conversational Intelligence,” where she writes about the concept extensively. 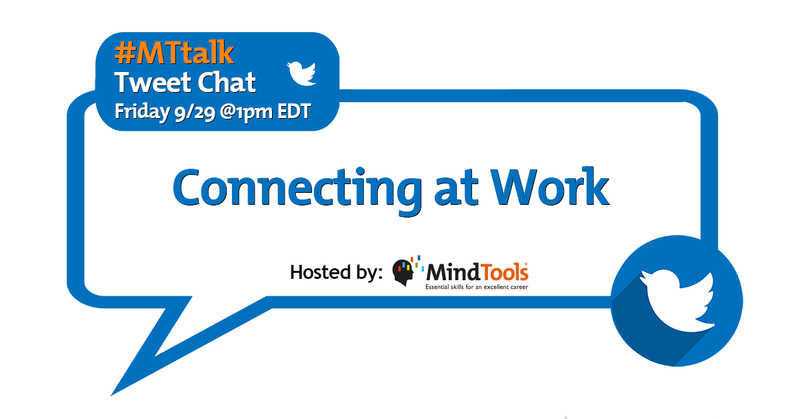 In our #MTtalk Twitter chat this week, we’re discussing connecting at work. In last week’s Twitter poll, more than 40 percent of you said that the most important element in building connections is having good social skills. To see how our participants voted about other aspects of connecting at work, have a look over here. In this Friday’s chat we’re going to talk about the importance of connecting at work, how to connect with people you don’t like, and how to build stronger connections. • What do we mean by “connecting”? • What’s the difference between communicating and connecting? • Is it easier for some roles/levels/types of people to connect than others? Who and why? • How has social media affected connecting at work? • What can you do to connect with someone at work that you don’t get along with/don’t trust, yet still have to interact with? • Where have you connected most effectively or easily, and why/how do you think that happened? • How might you help team members connect better with each other? At Mind Tools, we like hearing from people all over the globe. We’d like to learn from you, too, and we invite you to participate in the #MTtalk chat this Friday at 1pm EST (5pm GMT/10:30pm IST). Remember, we feature great participant responses right here on our blog every week! Follow us on Twitter to make sure you don’t miss out on any of the action this Friday! We’ll be tweeting 10 questions during our hour-long chat. To participate in the chat, type #MTtalk in the Twitter search function. Then, click on “All Tweets” and you’ll be able to follow the live chat feed. You can join the chat by using the hashtag #MTtalk in your responses.